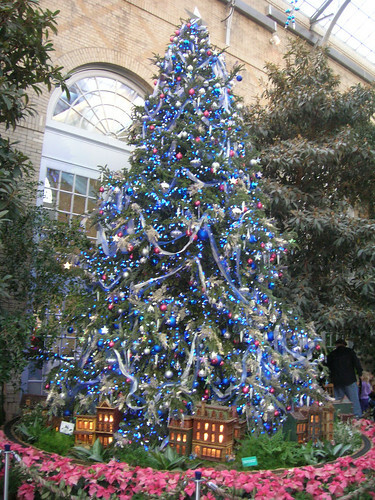 Last year, I happened upon Christmas at the National Botanical Garden (above) and just fell in love. Oh my gosh! This is the best Christmas display in the Nation's Capital. It catapulted me back to being 6 years old when Christmas was a magical holiday. Christmas was a holiday where angels sang, we waited excitedly for baby Jesus to be put in the manger at church. Rudolf, Santa, the elves and all the magical creatures of the holiday stepped out. I imagined the Christmas lights on the trees as tiny fairies dancing to the Christmas music. I imagined talking mice families stocking up on the good cookie crumbs my sisters and I would drop (granted the thought of little mice families doing that now really grosses me out). I love Lionel trains. Believe it or not I once had one. I love the little Christmas villages and was well on my way to collecting and building a magical one myself. I would imagine myself miniaturizing so I could fit in that perfect Christmas village, where you always got home on time to enjoy a nice cozy dinner with the family, sing carols, head to the high school for a basketball game, then to the diner for hot chocolate followed by a late night ice skating in the town square. A place where Christmas was always a sparkling snow covered paradise that never felt cold. I think this is why I love Christmas and decorating. However, I don't like how early everyone is decorating now. When you have two months of Christmas decorations and songs, it all kind of loses its 'specialness'. The National Botanical Garden is open until 8 p.m. tomorrow and I am going to try to make it down there to experience the magic and take pictures with my "good" digital SLR. I debate going in the evening because it will be very dark and I won't be able to photograph the details of the Christmas villages they will have set up - - but I can always go back on Christmas Eve during the day, right?